We’d love your help. Let us know what’s wrong with this preview of The Four Steps to the Epiphany by Steve Blank. 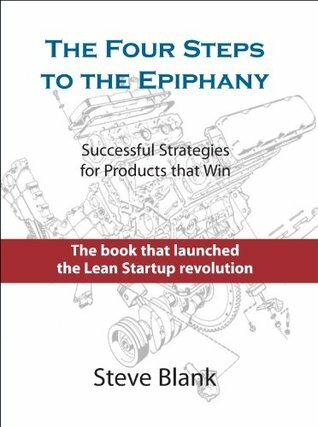 The Four Steps to the Epiphany launched the Lean Startup approach to new ventures. It was the first book to offer that startups are not smaller versions of large companies and that new ven The bestselling classic that launched 10,000 startups and new corporate ventures - The Four Steps to the Epiphany is one of the most influential and practical business books of all time. To ask other readers questions about The Four Steps to the Epiphany, please sign up. Involved in a startup at C-level or marketing - this book is a must read. It is good for people who are in the process of building startups. This book emphasizes that a great product or idea without a market is trash. The book includes some "case studies" and examples of business that failed for focusing on product development rather than customer development but seems to be lacking in success stories that we can relate to. Put to a vote, I might have been chosen “least likely to succeed” in my New York City high school class. My path has taken me from repairing fighter planes in Thailand during the Vietnam War, to spook stuff in undisclosed location(s), and I was lucky enough to arrive at the beginning of the boom times of Silicon Valley in 1978. After 21 years in 8 high technology companies, I retired in 1999. I sta Put to a vote, I might have been chosen “least likely to succeed” in my New York City high school class. My path has taken me from repairing fighter planes in Thailand during the Vietnam War, to spook stuff in undisclosed location(s), and I was lucky enough to arrive at the beginning of the boom times of Silicon Valley in 1978. After 21 years in 8 high technology companies, I retired in 1999. I started my last company, E.piphany, in my living room in 1996. My other startups include two semiconductor companies, Zilog and MIPS Computers, a workstation company Convergent Technologies, a consulting stint for a graphics hardware/software spinout Pixar, a supercomputer firm, Ardent, a computer peripheral supplier, SuperMac, a military intelligence systems supplier, ESL and a video game company, Rocket Science Games. After I retired, I took some time to reflect on my experience and wrote a book (actually my class text) about building early stage companies called Four Steps to the Epiphany. I moved from being an entrepreneur to teaching entrepreneurship to both undergraduate and graduate students at U.C. Berkeley, Stanford University and the Columbia University/Berkeley Joint Executive MBA program. The “Customer Development” model that I developed in my book is one of the core themes in these classes. In 2009, I was awarded the Stanford University Undergraduate Teaching Award in the department of Management Science and Engineering. The same year, the San Jose Mercury News listed me as one of the 10 Influencers in Silicon Valley. In 2007 Governor Arnold Schwarzenegger appointed me to serve on the California Coastal Commission, the public body which regulates land use and public access on the California coast.